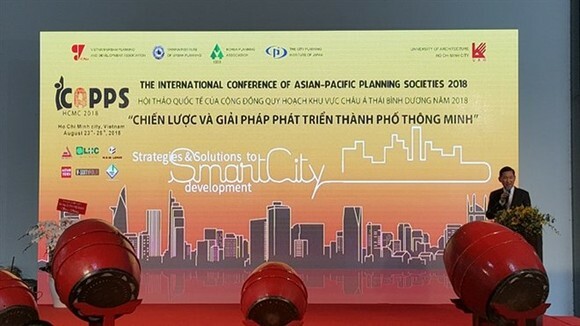 Around 400 Vietnamese and international architects and master planners discussed smart-city strategies and solutions at the 2018 International Conference of Asian-Pacific Planning Societies which opened on August 24 in Ho Chi Minh City. Begun in 1994, the conference is an annual forum of the Asian-Pacific Planning Community, which includes Japan, the Republic of Korea, Taiwan (China) and Vietnam. “The conference’s purpose is to develop and disseminate professional knowledge, share practical experiences and increase the capability of regional and urban experts,” Tran Ngoc Chinh, Chairman of the Vietnam Urban Planning and Development Association, said during his opening speech. “This year, the conference is discussing smart cities’ strategies and solutions in six categories: community, governance, urban planning, infrastructure, city education and mobility,” he added. Vietnam has 813 urban areas, with two major cities, Hanoi and HCM City. The urbanisation rate of the country is 38 percent, compared to the international rate of 50 percent, while the urban population accounts for 34 percent of Vietnam’s total population. “The sharply increasing population has exerted enormous pressure on Hanoi and HCM City’s infrastructure. Smart cities can transform urban management by applying technology that meets development demand,” Chinh said. “Building HCM City as a smart city is part of the drive for socio-economic development,” Tran Vinh Tuyen, Vice Chairman of the municipal People’s Committee, said at the conference. “Municipal authorities would like to hear practical experiences, knowledge and suggestions from international experts to assist the city in coping with traffic congestion, flooding and urban development,” he added. Experts from Japan’s University of Tokyo said that cities are meeting places for the creation of collective life that offers all residents a good life based on the idea of a city as a cultural, social and political product. “Other authors refer to rights of the city as a collective rather than an individual right, since city transformation depends upon the exercise of community empowerment to reshape the processes of urbanisation,” said Claudia Sakay from the University of Tokyo. Local incentives and active participation of citizens will result in smart and sustainable communities. “A smart community not only involves residents in land governance but also allows them to participate in the production and cooperation of their living environment,” she added. Other experts from the University of Tokyo described what good cross-border governance could be. They based their ideas on semi-structured interviews and surveys of the main stakeholders in “the heart of the Southwestern Amazon area”, including Peru, Brazil and Bolivia. The collected information was used to define power relations in the governance network (social network analysis), common elements for integration, and priorities for integration (mental mapping). As for smart urban planning, experts from the University of Tsukuba mentioned the impact of reconstruction planning in creating a vital urban space in central Hiroshima. “A significant task of reconstruction planning is to use the physical recovery as a catalyst for the restoration of urban vitality to damaged areas,” Kosuke Matsubara from the University of Tsukuba said. “After the staggering destruction of the city, Hiroshima was able to reclaim its vitality and reinvent itself as a symbol of world peace,” he added. Hokkaido University experts said that technologies and citizens should work side by side to form a strong base for a smart and resilient city, making citizens’ participation a top priority.